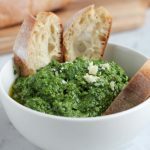 This pesto can be enjoyed with pasta, bread or crackers. Yields: about 2 - 2 1/2 cups of pesto. Combine the spinach, greens, parsley, garlic, and almonds in a food processor and pulse until coarsely chopped. With the processor running, slowly pour the olive oil into the bowl through the feed tube and process until the pesto is thoroughly combined. Add the Parmesan cheese and pulse until well combined. Season with salt and add the crushed red pepper flakes if using and enjoy!